There are countless ways to save money everyday. However, if you’re currently experiencing debt issues, simply knowing where to start can be a great challenge. Trying to do too much in the beginning can cause you undue stress, while remaining stagnant in your efforts does nothing to help your cause. When I was trying to weave my way out of my personal debts issues, I turned to the Bible for help. 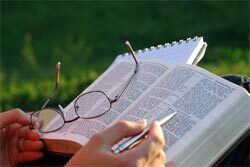 It may surprise you to know that the Bible offers up some good, common sense advice on a variety of topics regarding finance. Here you can see the importance of repaying your debts – as well as the prudence of not borrowing in the first place. Psalms 37:21. The wicked borrows and does not pay back, but the righteous is gracious and gives. Proverbs 22:7. The rich rules over the poor, and the borrower becomes the lender’s slave. These two verses suggest the importance of doing research and having patience when it comes to investing your money, and the necessity of establishing an emergency fund. Proverbs 19:2. Also it is not good for a person to be without knowledge, and he who hurries his footsteps errs. Ecclesiastes 11:2. Divide your portion to seven, or even to eight, for you do not know what misfortune may occur on this earth. If you don’t see the need to plan for your future, you need look no further than these scriptures. Proverbs 13:16. A wise man thinks ahead; a fool doesn’t, and even brags about it. Proverbs 21:5. The plans of the diligent lead surely to advantage, but everyone who is hasty comes surely to poverty. Saving money is not a matter of following a set of instructions – it is a mindset and a way of life. Focus on this concept into your daily life and you’ll be surprised at how many ways you can find to save a few dollars. And remember, if you find a way to save $10 a week, that translates to more than $500 on an annual basis. 1 Corinthians 16:2. On the first day of the week each one of you is to put aside and save, as he may prosper, so that no collections be made when I come. Proverbs 13:11. Dishonest money dwindles away, but he who gathers money little by little makes it grow. If you’re wondering where to start when it comes to getting out of debt, ask yourself one simple question whenever you reach for your wallet: Do I really need this? These passages back up this strategy. Proverbs 12:11. He who tills his land will have plenty of bread, but he who pursues worthless things lacks sense. Proverbs 28:1. He who tills his land will have plenty of food, but he who follows empty pursuits will have poverty in plenty. You’ll feel good when you donate your unused or unwanted items to a worthy cause, and you can also write off your donations at tax time. James 2:15-16. Suppose a brother or a sister is without clothes and daily food. If one of you says to them, “Go in peace; keep warm and well fed,” but does nothing about their physical needs, what good is it? What other Bible verses can you think of that teach about saving money? Love Prob 22:7 – we make that a big mantra at TTG. Debt just zaps a person of freedom and joy. O’ to get rid of the ties that bind! Absolutely wonderful article. great points to look forward. Its extremely essential to deal with your debts before the situation gets out of hand and you have to repent later on for not taking proper initiatives to get rid off it. Bible truly helps us out with various options to save money systematically. Doesn’t the Bible have some great insight into money? A lot of people don’t think God is concerned about money, but because it affects our lives, God is concerned about how we handle money! Thanks for the post! Awaiting to read something like this in near future. Giving is the key. We don’t become rich just to get rich. Otherwise we’re just another big rich jerk, and there’s already too many of those in this world. What we need is to become wealthy so that we can use that wealth to bless others. I really like this article. Thanks may God bless ! Prov 21 :20 the wise man saves for the future but the foolish man spends whatever he gets . Planning for tomorrow is time well spent, worrying about tomorrow is time wasted. Sometimes it is difficult to tell the difference, Careful planning is thinking ahead about goals, steps and schedules and trusting God’s guidance. When done well planning can help alleviate worry. Don’ let worries about tomorrow affect your relationship with God today. Definitely amazing article. great factors to look ahead. Holy bible truly helps us out with various choices to reduce costs consistently. Thanks to provide this nice content. I really experienced to study this article. This is precious and definitely amazing article. I was misinterpreting the verse in Matthew 6 v 30 to 34. I repent and understand it clearly now. Thank you so much. http://bryanvillarosa.com/2015/05/26/hospitality-through-saving-food-led-to-salvation/ Need to know other people’s thoughts on the ethics of OT with regards to savings. This article was really inspiring and refreshing…it gives you a change in perspective. I’m really glad to see you raise the topic of donations in this list. I published a post today about poverty, and interpretations of ‘the poor will always be with us’, which I see as a call to kindness, compassion, and an invitation to create a more equal world, not an excuse. Hope you have a lovely weekend, and thanks for sharing!